Due to the the ever-expanding data center consolidation, virtualization and cloud technologies, network installers feel the urge to maintain a competitive advantage of their infrastructure. Except for the performance, bandwidth and latency in datacenter cabling, management and operational agility and simplicity have also elevated themselves to the top mind of data center architects and operator. Cisco Nexus 900 series represents a familiar starting point on the journey toward a new era in software-defined network, which is announced to be the most port dense and power efficient plus fastest packet forwarder and programmable data center modular switch in the industry. This article introduces basic information of Cisco Nexus 9000 series and the cabling solutions for Nexus 9508 switch. According to Cisco’s announcement, the Nexus 9000 Series switch is the foundation of the Cisco next generation data center solution. The Cisco Nexus 9000 Series switch contains two main branches including the Nexus 9300 series fixed switches and Nexus 9500 series modular switches. Of particular interest is the Nexus 9508 of 9500 series, which is impressive in terms of performance, power efficiency, 10/40GbE and future 100GbE port density, programming environment and orchestration attributes. The following image shows the inner structure of the Cisco Nexus 9508 switch. Cisco Nexus 9508 can offer up to 8 line cards slots with a comprehensive selection of modular line cards in a 13RU space. 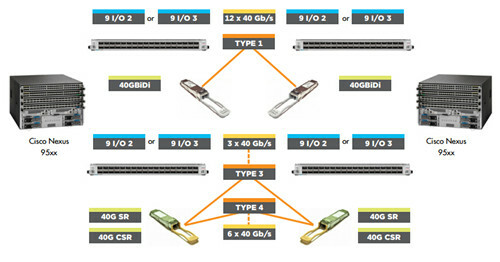 There are totally three line card options available: 48 port 1/10GbE SFP+ with four 40GbE QSFP+, 48 port 1/10GBASE-T with four 40GbE QSFP+ and 36 port 40GbE QSFP+ full line rate. The 1/10GbE line cards provide 640 Gbps of line rate capacity. And the 40GbE line card is based on QSFP+ form factor. From a network design perspective, the Cisco Nexus 9508 switch can be configurable with up to 1152 10 Gigabit Ethernet or 288 40 Gigabit Ethernet ports, which is very helpful for 10GbE & 40GbE migration. Predictable high performance—The switch delivers 30 Tbps of non-blocking performance with latency of less than 5 microseconds, enabling data center customers to build a robust network fabric that can scale from as few as 200 10 Gigabit Ethernet server ports to more than 200,000 10 Gigabit Ethernet server ports. Nonblocking, high-density 1 to 10 & 10 to 40 Gigabit Ethernet transition—The Cisco Nexus 9500 platform helps organizations transition from existing 1 Gigabit Ethernet Cisco Catalyst®6500 series switches server access designs to 10 Gigabit Ethernet server access designs with the same port density. And it can also helps organizations transition from 1 and 10 Gigabit Ethernet infrastructure to 10 and 40 Gigabit Ethernet infrastructure to support the increased bandwidth demands. Advanced optics—This switch can directly use the pluggable 40 Gigabit Ethernet QSFP+ bidirectional transceiver that enables customers to use existing 10 Gigabit Ethernet data center cabling to support 40 Gigabit Ethernet connectivity. Highly available, scalable, and robust solution—All major components are redundant, including supervisors, system controllers, power supplies, and fan trays. The switch line cards use a mix of merchant and Cisco application-specific integrated circuits (ASICs) to produce a low-complexity, low-cost design. All buffer memory is integrated into the forwarding ASICs, avoiding the need for a large number of external memory modules. All transceivers are pluggable to support the highest possible mean time between failure (MTBF) for the switch. What’s more, the flexible and efficient chassis design has 100% headroom for future expansion with the capability to support more bandwidth and cooling and twice the number of power supplies needed to support today’s maximum configuration. Power efficiency—The Cisco Nexus 9500 platform is the first switch chassis designed without a midplane. Line cards and fabric modules connect directly. This design approach provides optimal front-to-back airflow and helps the switch operate using less power. In addition, all Cisco Nexus 9000 series power supplies are 80 Plus Platinum rated. The typical power consumption per 10 Gigabit Ethernet port is less than 3.5 watts (W). The typical power consumption of each 40 Gigabit Ethernet port is less than 14W. As we all know, direct attach cables (DACs) are often used to connect two or more switches which are in the same rack or in the adjacent rack. This is done to reduce the cabling cost for which DACs are much cheaper than transceivers and fiber patch cords. The following figure shows a wiring option for a Cisco Nexus 9396 to Cisco Nexus 93128 using 40G QSFP+ to 40G QSFP+ DAC cabling assemblies. The Cisco Nexus 9508 switch can also be operated in 4×10 Gigabit Ethernet mode. If the interface is logically configured as a 4×10 Gigabit Ethernet port, then each port becomes four 10Gbqs port. This will be accomplished by using copper twinax, hydras or breakout cables. This scenario can be achieved by connecting a Cisco Nexus 9000 Series Switch to a Cisco Nexus 2232 using a QSFP+ to four SFP+ copper hydra cable assembly. Multimode fiber cabling is generally preferred when the distance between Cisco Nexus 9508 switch and other switches is less than 400 meters. In this circumstance, 40G QSFP+ SR4/CSR4 transceivers and MPO interconnect cable assemblies are often used. 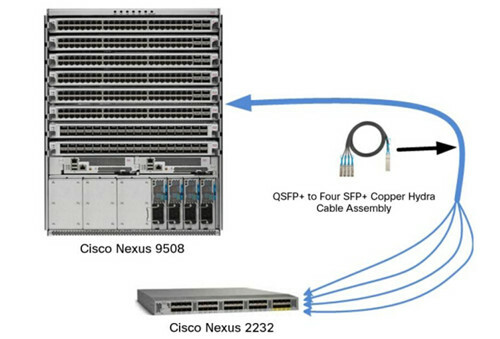 The following scenario shows how the Cisco Nexus 9508 switch is connected to Cisco Nexus 93128 switches with 40G QSFP+ SR4/CSR4 optics and MPO cable assemblies. As noted before, Cisco 40G SR-BiDi QSFP can be used in Cisco Nexus 9508 switch for 40G connectivity. The 40G BiDi QSFP multiplexes two 10GbE signals into one 20GbE stream and runs two 20GbE wavelengths on the optics side, and delivers a QSFP pluggable MSA compliant electric signal to the switch module, thereby only requiring the termination of a dual LC connector as used in 10GbE optical infrastructure. The SR-BiDi QSFP enables the re-use of existing 10GbE multimode fiber cable infrastructure plus patch cables as it supports the same LC connector. The SR-BiDi QSFP eliminates the cable infrastructure upgrade requirement of today’s 40GbE, which can lower capex of cabling and switch hardware. The following image shows the Cisco Nexus 9508 switch using 40G BiDi transceiver providing a zero-cost fiber cabling upgrade path for 10GbE to 40GbE. Cisco is offering a practical way to transition to higher speed data center networking through favorable economics. With the use of Cisco Nexus 9508 switch, designers will embrace a new programmable network platform ready for the age of software-defined networking. FS.COM provides various 40G QSFP+ transceivers and fiber optic cable for the 40G connection of Cisco Nexus 9508 switch. 10G SFP+ transceivers and MPO/MTP-LC harness fiber patch cables for the 10G SFP+ to 40G QSFP+ direct connection are also provided. Please kindly contact us for more information.